Google + is here, big time. If it will become a success or not, we’ll have to wait and see. But Google doesn’t stop there. It is just the beginning actually. One of the first things they’ve rolled out after Google+ is the ability for webmasters to track and measure their +1 buttons, both in Analytics as in Webmastertools. Social Engagement has really become the main focus for Google. In Webmastertools you will now find a section called “+1 Metrics”. 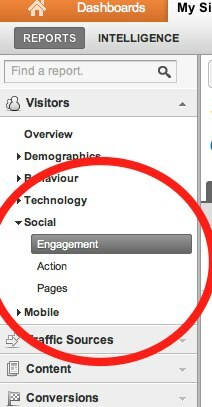 Within this section you can look at “Search Impact”, “Activity” and “Audience”. The Search Impact report gives you an idea of how +1‘s affect your organic search traffic. You can find out if your clickthrough rate changes when personalized recommendations help your content stand out. Do this by comparing clicks and impressions on search results with and without +1 annotations. We’ll only show statistics on clickthrough rate changes when you have enough impressions for a meaningful comparison. Finally, the Audience report shows you aggregate geographic and demographic information about the Google users who’ve +1’d your pages. To protect privacy, we’ll only show audience information when a significant number of users have +1’d pages from your site. To get +1 data in your Google Analytics you will need to use the Social Plugin Tracking in Google Analytics. If you are using the newest version this will be on automatically. Social Engagement report: how does site behavior change for visits that include clicks on +1 buttons or other social actions. Social Actions report: track the number of social actions (+1 clicks, Tweets, etc) taken on your site. Social Pages report: compare the pages to see which are driving the highest the number of social actions. With this you can figure out whether or not people click the +1 button on your site and if people who actually +1 your website will become more loyal visitors, do they spent more time on your site than others for example. The above is all about +1. That is off course what Google wants to push. But there is a lot more social data going around and a lot more social activity on your website to measure. You’ll have to do a little bit of work to start tracking that too. Google describes “Social Interaction Tracking” on a special page. It looks more difficult than it is. For a social network to be measured “you need to integrate Google Analytics tracking with each network button”, so for each like button, tweet button or any other button you have to put a line of code into the website. Google explains that you’ll need to use the _trackSocial method. This will send the data to Analytics. There is actually a lot you can do with this. Go check out the Google Code page on this and take what you need. Tracking will become a lot more interesting with the social elements in there, especially because a lot of traffic comes from Social Networks these days. You have to be careful when you look at the different numbers around +1: Where Google Webmastertools looks at all +1 interactions around the web, so also in the search results, Google Analytics reports include only +1 interactions that occur on your website domain. On the other hand, the Google Analytics data is much more up-to-date. Great post! Very interesting reading! Hope you could help me with a question: Where in the var _gaq google analytics script should the facebook like tracking be implemented? In front of _gaq.push([‘_trackPageview’]); ? @Magnus: it’s difficult to say right now, google doesn’t provide clear documentation yet on this point. But as with event tracking you first should have a trackPageview so that all cookies etc. are set. That also seems very logical: first a pageview and than a social interaction. This line of code should not be put in the main Google Analytics tracking script but only on places where social interactions happen. Thanks for your answer André! We’ll have a look at it and will come back to you if we find a solution. The inclusion of Social Plugin Tracker in Google Analytics shows the wide impact of user-generated content and social media Websites on Web Search Result Pages. Indeed, Google is giving more preference to Facebook Likes, +1, Twitter Tweet, and other social signals than traditional SEO methods. It means there is an effect of social media activities on the Google Search for a particular URL. Analytics now shows us the tracking of social signals at our Website.